Now here’s an excavation that I think is worth watching. Archaeologists at Gimhae National Museum in South Korea will return next week to the site of Bibong-ri, along the country’s southern coast, to expand their excavations. Some five to six years ago, archaeologists working at the shell-midden site made a stunning discovery: the waterlogged hull of an ancient wooden boat. Subsequent radiocarbon dating revealed that the wooden vessel was 7700 years old–the earliest known boat to date. At first glance, this might not seem particularly exciting. Archaeologists now know that human beings became seafarers at least 50,000 years ago, when modern humans crossed nearly a dozen straits to reach Australia from Southeast Asia. And the new archaeological evidence of stone hand-axes from Crete suggests that ancient humans may have been island-hopping in the Mediterranean 130,000 years ago or earlier. What kind of watercraft did these early seafarers favor? We simply don’t know, although some archaeologists speculate that the early mariners from Southeast Asia voyaged to Australia on rafts made from giant bamboo. But the big problem is that archaeologists have yet to excavate any watercraft from such an early period. 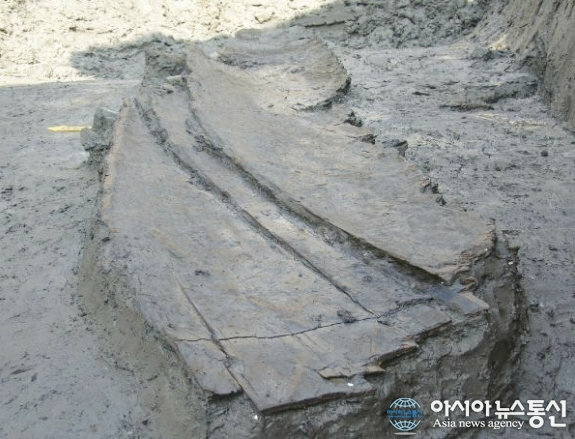 So the discovery of an 7700-year-old boat in a Korean shell midden is a very important one, giving archaeologists a precious glimpse of Neolithic nautical technology. Researchers will have a lot of questions. Was the boat powered by wind and sail, for example? Or was it powered by the muscle of human paddlers? How was it constructed? How many sailors did it hold? I find it interesting that three of the world’s oldest known watercraft–the vessel from Bibong-ri; a 7500-year-old wooden boat excavated in China; and a 5600-year old logboat unearthed in Japan–all come from eastern Asia. Is this merely a coincidence, based on random preservation of wood at three sites? Or could this hint at the deep antiquity of boat-building and seafaring in this part of the world, an antiquity that we have yet to plumb? These are not idle questions. Archaeologists have long discussed the possibility of a very ancient coastal migration by boat from western Asia to the Americas. Indeed one possible scenario, proposed by University of Oregon archaeologist Jon Erlandson, has ancient seafarers setting out by boat from coastal Japan some 15,700 years ago–during the last Ice Age–and nudging northward along the shores of Asia to those of the New World. To do so, these migrants would have needed some kind of sturdy boat–possibly a kayak or ocean-going canoe. I’m very keen to see what else the Korean team will find at Bibong-ri this time around. We badly need more information. What is the average temperature in the waters of Bibong-ri? I suspect one reason why Asian shipwrecks are topping the age charts might be the cooler waters, relative to what shipwrecks in the Mediterranean must face. But that’s probably just my Greek ancestry bias talking.